LONDON: Treated by many as a pariah after the US subprime collapse triggered the 2007 global financial crisis, real estate is increasingly bouncing back with insurance, pension and sovereign wealth funds. The evaporation of interest rates on high-quality government bonds is encouraging asset managers to look again at prime real estate properties and stocks, where they find returns far outshooting socalled “safe” sovereigns. Sovereign wealth funds are a US$4 trillion business and pension funds cover more than US$30 trillion, so even a small shift could move billions away from lower-yielding and more volatile assets. Top-of-the-crop commercial and residential properties from London to Bangkok are in demand and there are signs of a bottoming out in the US housing market, prompting major investors to buy foreclosed homes to rent. A sign of increasing interest in the sector can be seen in real estate funds, which have attracted more fresh money than other sectors this year, according to fundtracker EPFR Global. Andrew Economos, head of sovereign and institutional strategy for JP Morgan Asset Management in Asia, says sovereign wealth funds are particularly active. “Sovereign wealth funds are looking for positive yields and they are finding anywhere between 5% and 7% in real estate. They are getting yield on purchase as well as capital appreciation,” he said. “They are diversifying across real estate into commercial, trophy properties as well as REITs (real estate investment trusts),” he said. REITs are securities sold like a stock and which invest in real estate properties or mortgages. In one of the most recent high-end deals, Norway's sovereign wealth fund teamed up last month with Italian insurance giant Assicurazioni Generali to manage prime office and retail properties worth 550 million euros in central Paris. Norway's sovereign wealth fund NBIM, which holds assets worth about 3.6 trillion Norwegian crowns (US$598.93bil), plans to raise real estate assets to as much as 5% of its overall portfolio from 0.3% at the end of March. China's US$482bil sovereign wealth fund Investment Corp said on Wednesday this was one of the sectors it was now focusing on. One way that investors are tapping the real estate market is through stocks and real estate investment trusts, which offer substantially higher dividend yields than sovereigns in areas spanning from Europe and the United States to Japan. Dividend yields for stocks listed on the MSCI real estate index for the eurozone reach nearly 7%, according to Thomson Reuters Data-Stream, which beats by far negative or near zero yields for government bonds in core countries Germany or France. This is also higher than other sought-after assets including corporate bonds, which offer an overall yield of 3.24% on the iBoxx index. The MSCI real estate eurozone index is up 13.1% since the beginning of the year compared with 2% for the overall MSCI index for the region, Data-Stream shows. Yields on prime commercial or real estate housing the actual property rather than stocks vary widely but analysts give estimates of an average 35% for the best property in Europe. “Certainly the work that we have done on an advisory basis to clients in the past three to four months has highlighted the importance of property in their portfolios,” said Ken Adams, global strategist at Scottish Widows Investment Partnership. That market is highly polarised, however, with anything less than outstanding properties offering long leases with financially sound tenants in sought-after areas being spurned by investors put off by recession and the euro debt crisis and prices for these more secondary assets falling. Commercial real estate, which had widely collapsed in the wake of the subprime crisis, was competing with other high-yield assets such as emerging market bonds and must offer the safety of a high-quality bond with better yields to attract investors such as pension funds, said John Danes, property research director at UK fund manager Aberdeen Asset Management. “The return has to be very financially secure, with long leases and if there is some kind of inflation link as well, all the better,” said Danes, adding that he had seen increased interest across sectors, from long-let retail and offices to British supermarkets, which he said offer financially solid tenants and yields of 4.55%. In the birthplace of the subprime crisis, in the United States, a number of investors are focusing on the opportunities that have been created in housing. Blackstone Group LP has spent more than US$300mil to purchase over 2,000 foreclosed homes to rent and bet on a recovery of the US housing market, the firm said in mid-July. Although analysts forecast any growth in the US housing market would be sluggish and it could take 10 years or more to go back to 2006 peak levels, commercial housing had seen nine consecutive quarters of uninterrupted improvement with vacancies down and rents up, said Citi analyst Jeff Berenbaum. “Yields are in the high 3% to low 4% range for the strongest properties,” he said. On the housing front globally, prime property in major cities has seen its strongest growth since 2010 in the second quarter, with a 1.3% growth in the year to June, according to Knight Frank's prime global cities index, which tracks the top 5% of mainstream markets. Although KLCC Property has yet to provide further details on the REIT venture, analysts remained positive on the idea. KUALA LUMPUR: The Employees Provident Fund (EPF) has been increasing its exposure in KLCC Property Holdings Bhd this month, where the pension fund has spent over RM10 million to buy more than two million shares in the property investment company. While the net acquisition may not be significant, it may be a sign that EPF likes KLCC Property's idea on exploring the possibility of a real estate investment (REIT) structure as a move to further unlock value gains in the property market. 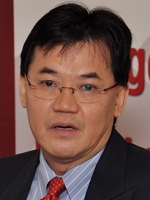 In a HwangDBS Vickers Research report, it explored two possible scenarios for a REIT structure (a pure retail REIT and a mixed REIT) where asset sale proceeds could touch RM4.8 billion and RM13.6 billion, respectively, based on cap rates of six per cent for retail, six to seven per cent for offices and eight per cents for hotels. "While the timing remains uncertain, this is a positive step to help unlock value and allow non-corporate shareholders to benefit from REIT distribution's lower tax rates. "We do not discount the possibility of the RCULS (redeemable convertible unsecured loan stocks) overhang being addressed as well. "Petronas can convert RM714 million RCULS anytime as they are in the money (RM1.98 conversion price, 2014 mandatory conversion), raising its stake in KLCC Property to 66 per cent from 51 per cent," said the report. KUALA LUMPUR: AmMutual, which is positive on the Asia-Pacific real estate investment trusts (REITs) market, is keeping its options open on buying more REITs in the region, but much will depend, among others, on the liberalisation of a country's REITs regulation. Its chief investment officer for equities Andrew Wong said the company would buy properties for REITs investment in any country in the region where REITS regulations were liberal, adding that this was one of the important considerations in the REITs business. Wong says AmMutual will focus on the Asia-Pacific market in the next 12 months. AmMutual is the conventional unit trust brand that is managed by the AmBank Group. Besides this, he said the company would also look into countries where the demand for property REITs exceeded its supply, as well as the liquidity requirement in terms of liquidity risk when it exits certain properties in the region. He was speaking at a media briefing on investments in Asia-Pacific REITs. Currently AmMutual, via its wholly managed property fund - AmAsia Pacific REITs - has property REITs, in Australia, Singapore, Japan, Thailand, Hong Kong and Malaysia, among other countries. It is also looking to buy REITS in countries in the region where the economy is starting to thrive. Wong said the company's exposure to Malaysian REITs at present was about 7% and that it would consider buying others if the price was right, noting that it was also eyeing the soon to be listed IGB REITs. For the next 12 months, he said the focus would still be on the Asia-Pacific region. On the type of Malaysia REITS, he said the company was comfortable and keen on retail REITs, neutral on office REITs, partly due to the over-supply situation and mindful on logistics because of the liquidity of its REITs universe. For the liquidity level of the REITs stocks, he said the company's cut-off point was preferably those with a minimum RM1.5bil in market capitalisation. AmAsia Pacific REITs has raked in total returns of 20.8% to date since its inception on July 18 last year. The property REITs fund also has an annual average dividend yield of about 6% and is the only fund in Malaysia to solely invest in the Asia-Pacific REITs. On the challenges of REITs, Wong said this would be closely linked to the state of the economy and foreign direct investments. Apart from this, the demographics of a particular country, for example its immigration laws, are important as this would entice people and investments into the country.